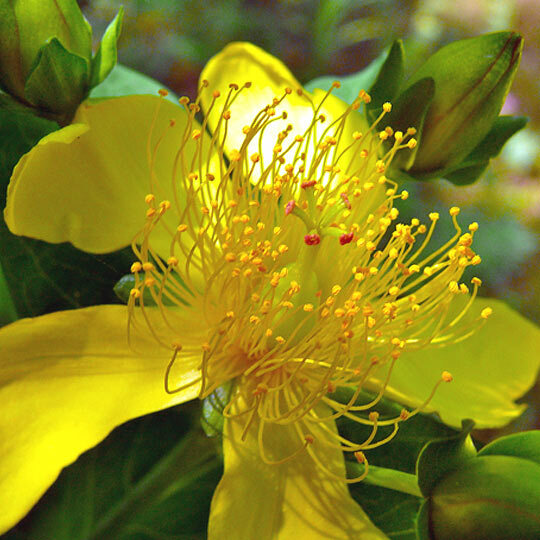 A natural aid to help lighten your overall mood, St John's Wort has been used for centuries to combat mild depression. It's active component, Hypericin, is also antibiotic. St John's Wort is widely known as an herbal treatment for depression. In some countries, such as Germany, it is commonly prescribed for mild depression, especially in children and teenagers. St John's Wort is superior to placebo in patients with major depression. St John's Wort is similarly effective as standard antidepressants. St John's Wort has far fewer side-effects than standard antidepressants. Most studies of St John's Wort for treating depression used doses of 300 mg of an extract (standardized to 0.3 percent hypericin content) three times daily to achieve a therapeutic effect. It is safe to take from 300mg up to 1,800 mg daily (the equivalent of 6 capsules). There have not been any reports of overdose or negative effects from higher dosages. St John's Wort has also been shown to be neuroprotective and has active antioxidant ingredients, which have yet to be isolated. St John's Wort performs a similar function to 5-HTP and Valerian Root, but St John's Wort is more exclusively for mild depression and mood lightening, 5-HTP and Valerian Root is also of benefit to those who experience insomnia or for women who can't take St John's Wort because they are taking the contraceptive pill. Take one pills 3 times daily, with or without food, with water. Do not exceed the stated dose. St John's Wort should not be used by women taking the contraceptive pill. Based on three capsules per day single daily capsule, a 90 capsule pack would last for 1 month.